The halls of Hesler look more like an art museum than the plant biology section of a science building thanks to a generous donation from Michael A. Mouron in honor of his father, Alfred Mouron, a graduate of the UT engineering program (’41). But art and science work in harmony, reminding the next generation of botanists of the natural beauty of their subjects, even when they are working in the lab. W. Graham Arader III facilitated the donation of dozens of fine, hand-colored engravings to the McClung Museum of Natural History and Culture. Some of the works are on loan to EEB so they can be displayed on the second and third floors of Hesler for all to view and appreciate. The collection includes works by Pierre-Joseph Redouté, Robert John Thornton, and Johann Wilhelm Weinmann. Most of the works depict an individual species, but some show small thematic groups of plants (e.g. 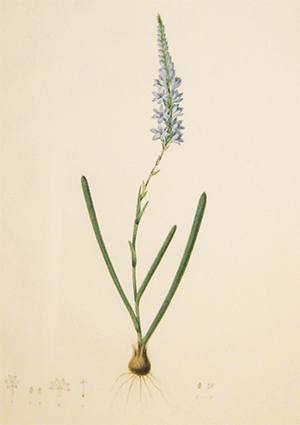 American bog plants), and there is even a portrait of Carl Linnaeus, the father of modern taxonomy. Other donations facilitated by Arader are installed in the Burchfiel Geography Building and Ayres Hall. Arader’s mission is to bring the art and science of natural history illustration to the next generation.